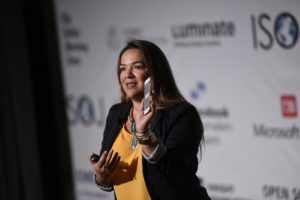 A “lightning round” of presentations at the 20th annual International Symposium on Online Journalism (ISOJ) covered an array of developments from a new initiative to support Latin American journalists to the potential of location-based reporting. 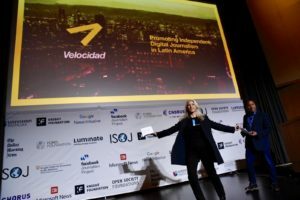 Janine Warner and Luis Botello kicked off the short presentations April 13 with the unveiling of Velocidad, a new $1.5 million fund designed to support digital journalism in Latin America. Warner is executive director and co-founder of SembraMedia and Botello is vice president of New Initiatives and Impact at the International Center for Journalists (ICFJ). Warner said Velocidad, dubbed a “media accelerator,” will be non-ideological but will focus on digital native news outlets. In addition to grants, Velocidad will also provide 1,600 hours of consulting support to independent media in Latin America. In addition to helping tell “stories that other media are too afraid to tell or too compromised to tell,” said Warner, the program will assist digital news outlets with management issues like proper accounting, which she said can be terribly important if a government tries to shut down a news operation with a tax audit. Felipe Estefan, investment director for Luminate, followed Warner and Botello, which was appropriate considering Luminate is partnering with SembraMedia and the ICFJ to launch Velocidad. Luminate, a global philanthropic organization and part of The Omidyar Group, has spent more than $306 million funding 236 organizations in 17 countries. Estefan grew up in Bogotá, Colombia, where journalists risked their lives telling difficult stories. “It’s absolutely crazy to me” that some people still believe journalism is not worthy of investment, he said. 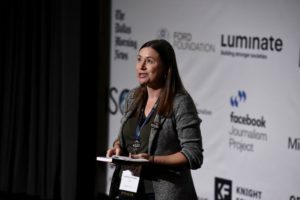 Nadine Hoffman, deputy director of the International Women’s Media Foundation (IWMF), briefed the ISOJ crowd on a day-long workshop held April 11 at the Belo Center for New Media at the University of Texas at Austin. The workshop “Strategies to confront online violence: Female journalists cultivating resilience and building community” was hosted by the Knight Center for Journalism in the Americas with assistance from IWMF and the Knight Foundation. Hoffman said online harassment of women journalists, especially women of color, is an issue that affects everyone. “The long-term impact is clear. It’s about retention,” she said, referring to the need to keep women in journalism because true press freedom can only exist with equal voices of women journalists. A survey of 597 women journalists and media workers showed at least two-thirds had experienced online harassment (such as body shaming) at least once, while 40 percent admitted they avoided reporting certain stories because of the harassment. “That’s a threat to press freedom and democracy,” Hoffman said. Some of the takeaways from the workshop include urging news outlets to separate private and public presence on social media platforms for women journalists and building peer support networks to help women deal with online harassment. “We know that digital attacks need to be taken seriously,” Hoffman said. Another pre-ISOJ event, “Hackathon: Build news credibility tools” was reviewed by Andrew Gibson, a front-end engineer at The Texas Tribune. The hackathon was organized by the Tribune and the Knight Center for Journalism in the Americas, and sponsored by Microsoft News and Walmart Technology. Gibson was impressed by the creative output of six teams — comprised of five to seven journalists, data engineers, designers and developers — in one day, when most hackathons are at least two days. The winner was Nutrinews which built on the idea of food nutrition labels. This “news nutrition label” would be based on the content of a news article, who wrote it and who shared it. Moving in a different direction, but still focusing on improving journalism, Amy Schmitz Weiss talked about how “location journalism” could enhance local reporting. Schmitz Weiss is an associate professor at the School of Journalism and Media Studies at San Diego State University, as well as research chair for ISOJ and co-editor of the #ISOJ Journal. She suggested a scenario where a mother and her kids are at a playground when she gets a text asking if she is okay. “Why?” the mother replies. “What’s going on?” There’s an active shooter just two blocks from that park, her friend replies. “She had no source to tell her that information,” Schmitz Weiss said. Schmitz Weiss, who is a strong proponent of “spatial journalism,” said location-focused journalism should be an opportunity for news organizations, many of which already have location data in archives courtesy of their local reporting. Wrapping up the lightning round at ISOJ was Selymar Colón, vice president and editor-in-chief for Digital News at Univision. She made a passionate and fun plea for journalists to shoot video vertically with their smartphones instead of horizontally. In addition, Colon said, news outlets strive to reach young people and yet most of them lock their phone on vertical.